Successfully Added VKWorld Z3310 Cell Phone - Number Pad, Dual-IMEI, 2MP Camera, 1450mAh, 2.4-Inch Display, Bluetooth (Grey) to your Shopping Cart. 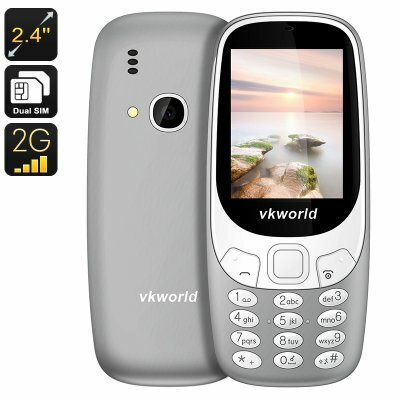 The VKWorld Z3310 is a simple cell phone that comes packed with a whopping 1450mAh battery. With this cell at your side, you’ll be able to enjoy 16 hours of continuous usage time. This will get you through multiple days of regular mobile phone usage. Additionally, it brings along an unbelievable 600 hours of standby time. Thanks to this, you’ll be able to head out with confidence as you won’t have to worry about running out of battery any time soon. This epic battery makes the VKWorld Z3310 perfect for senior citizens that do not remember to recharge their device on daily basis. With this senior phone in their pocket, they’ll always be able to stay within reach to friends and family even when they’re not around. This cell phone features a stylish yet durable design that is capable of taking a hit. It comes with a traditional number pad and 2.4Inch display. The phone is extremely simple to use which makes it a great device for children or the elderly. Furthermore, it features two SIM card slots and Dual-IMEI numbers. Thanks to this, the VKWorld Z3310 brings along great connectivity. Additionally, it comes with a 2MP camera to snap pictures and an FM radio. With 8GB external memory support, your cell phone offers plenty of space to store your photographs, files, and media. This senior phone comes with a 12 months warranty, brought to you by the leader in electronic devices as well as wholesale electronic gadgets..